The CTA is seeking community input on the location, design, and social, economic, and environmental effects of the proposed improvements at a Red-Purple Bypass Open House to be held from 5:30 PM to 7:30 PM on Thursday, May 22, at the 19th District Police Station, 850 W. Addison St.
Download the CTA's brochure on this project (.pdf). Visit the CTA's website for more information, including conceptual renderings, information on the current Environmental Assessment, and directions on how to be added to the contact list for meeting notices and future updates about the Red Purple Modernization (RPM) project. Currently, when northbound Brown Line trains travel across this intersection, any northbound or southbound Red or Purple line train approaching this intersection must stop and wait for signal clearance. This means as many as three Red and Purple line trains may be simultaneously delayed. This outdated track configuration dates back to 1907 and was designed to provide local and express service, rather than connect three separate routes as it does today. Fig. 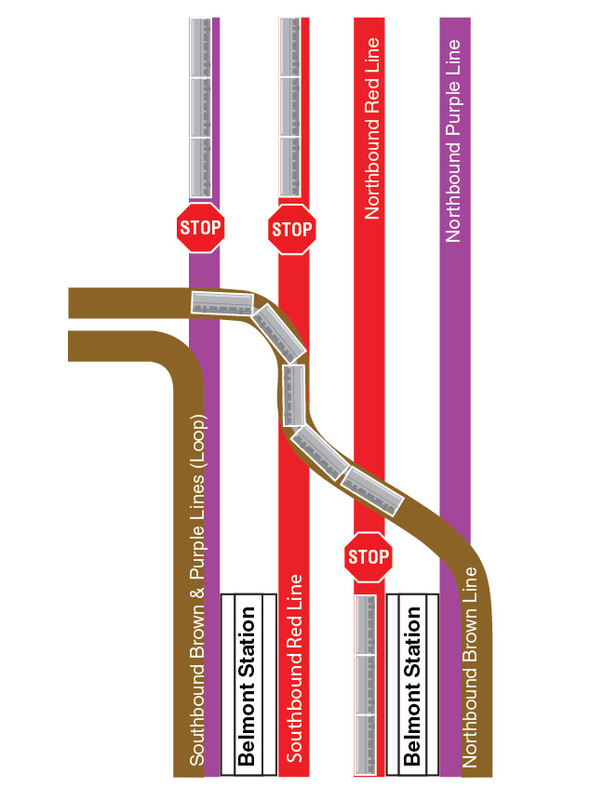 1: The current track configuration just north of Belmont requires up to three Red and Purple line trains to stop and wait for a single Brown Line train to cross. This happens throughout every weekday, but more frequently during rush hour when trains must wait for signal clearance every three to four minutes. 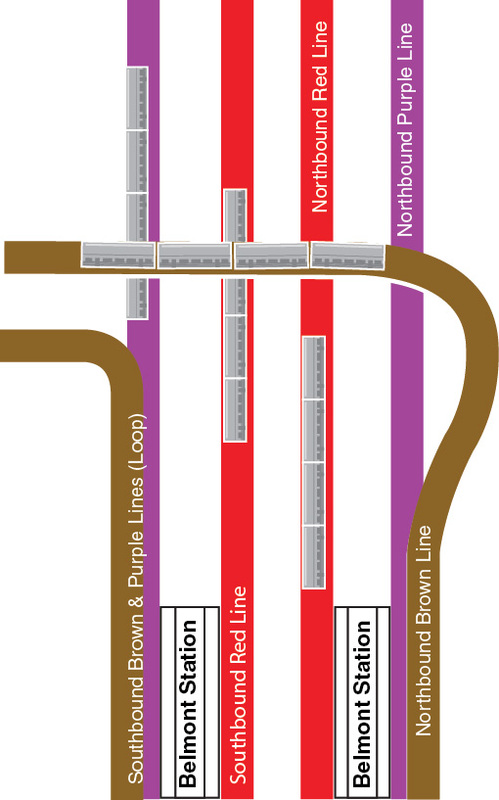 This configuration can produce rippling delays to services on all four tracks, delaying over 40 percent of all weekday Red, Purple, and Kimball-bound Brown Line trains. Fig. 2: A bypass would provide a dedicated track for Brown Line trains. This means trains and thousands of customers traveling on all four tracks will no longer need to stop and wait for signal clearance at this intersection. This entry was posted in Uncategorized on May 21, 2014 by elvn_updates.